Coach Geni Burts was born in Dallas Texas and started swimming with the U.S.V.I. in St. Croix Dolphins at the age of 5. In 1994the family, younger sister Tracy, mother Maria, and father Jess, moved to south Florida and reside here currently. 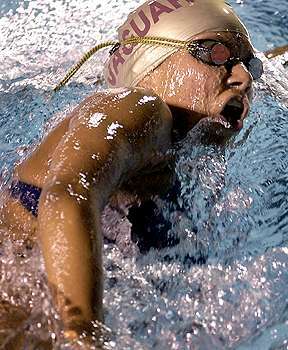 She is very familiar with Florida Gulf Coast Swimming and has competed here for the past 10 years. Her home club team is the Pembroke Pines Comets and high school teams Charles W. Flanagan Falcons/Pembroke Pines Charter Jaguars. Her accomplishments include qualifying for Districts, States, Zone Championships, distance camps in Pensacola FL and the Olympic training center in Denver CO, Sectionals, Junior Nationals, Senior Nationals and two US Opens. While competing in collegiate Division 1 swimming she was awarded All-Time Sun Belt Women’s Swimming & Diving Team, a numerous conference champion, MVP and Hardest worker throughout her collegiate career, women’s team captain junior and senior year. 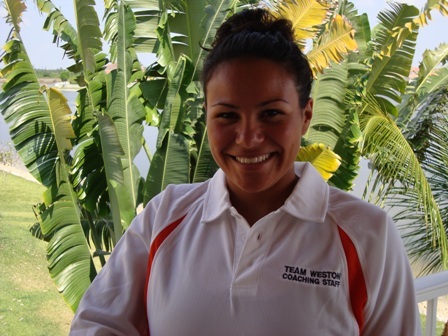 She has assisted with the Pembroke Pines Comets and was previously age group coach at Florida Atlantic Swim Team. She has recently graduated from Florida Atlantic University a full scholarship student athlete with a degree in Business Administration. I hope to inspire and help guide younger generation of swimmers with my experience and hard work ethic to accomplish their goals on and off the pool deck.